According to a Government report, 43% of UK businesses have suffered a cyber attack over the past twelve months and the majority of these are aimed at small to mid-sized organisations. The risk to business is very real and is no longer a question of ‘if’ you will suffer a cyber attack but ‘when’ you will be attacked. We help our customers to raise their cyber security, protecting their users when browsing the internet from opening the door to malware and malicious cyber attacks. Traditional internet security is provided at the firewall level, enabling organisations to restrict the sites that users can visit and utilising static lists of potentially malicious sites based on reputation. At amatis we utilise Cisco Umbrella to extend the depth and breadth of protection without imposing further restrictions on your users. Cisco Umbrella raises your protection to the DNS level and utilises real-time intelligence to analyse every web access request to determine if this is a site that is safe for your users to visit, you no longer have to be heavy-handed when restricting access. By elevating your internet security above the Firewall level you instantly gain the benefit of protecting users regardless of where they are. For users working from home, in the café or on the move that are not behind the firewall, they remain protected by Cisco Umbrella every time they access the internet. This significantly reduces the risk of corporate or personal devices becoming infected with malware and then spreading this to the corporate network when next connected. Delivered as a cloud service, this solution is able to utilise big data and benefit from intelligent analytics and machine learning to keep pace with the threats we face. Cisco Umbrella analyses over 150 billion page requests from 90 million users each and every day and utilises this intelligence combined with feeds from third-party sources to determine if each web request you make is safe. 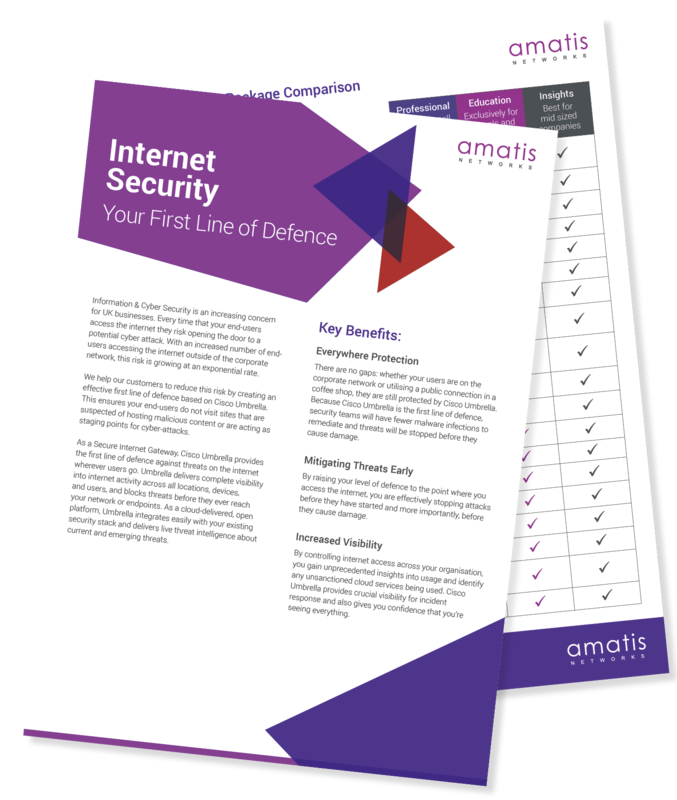 Putting in place Internet Security from amatis is probably one of the simplest steps you can take to protect your organisation. As a cloud-based service, there is no hardware or software required and no complex configuration. You simply point your users at the Cisco Umbrella DNS service and immediately gain all of the benefits of DNS protection from the industry leader.